This is only part of the report the Winn Foundation did for IBD disorders. We posted this part of that report because it shows their important research findings on Taurine deficiency in rabbit for our ground rabbit feeders. The full report is available upon request. “After some thought, we decided on a diet made up entirely of rabbit. Rabbits were readily obtained from a rabbitry producing meat for human and exotic animal consumption, and were of comparatively low cost. Mice may have been more appropriate, but procuring and processing this number of mice was not practical. Moreover, in places where rabbits are abundant, feral felines have been known to choose them as their primary prey (Molsher et al., 1999). Since felines eat most parts of their prey and essential nutrients are concentrated in different organs, the rabbits were not skinned, dressed or cleaned, but rather ground in their entirety. The ground whole rabbit diet was frozen in smaller batches and thawed prior to feeding. The felines readily consumed both diets, but the palatability of the raw rabbit was noticeably greater; the felines ate it more rapidly and aggressively. After one week in the study, the felines on the rabbit diet all had significant improvements in their stool quality based on a visual stool grading system (developed by the Nestlé-Purina PetCare Company). After one month, the felines on the rabbit diet all had formed hard stools, while the commercial diet felines had soft formed to liquid stools. These differences persisted to the end of the feeding trial. The felines that were fed the whole rabbit diet outwardly appeared to have better quality coats, but objective measurements were not made. Interestingly, we could find no relationship between the type of diet consumed and: 1) the rate of growth, 2) degree of inflammation in the tissue lining the intestinal tract, or 3) the numbers of bacteria in the upper small intestine. 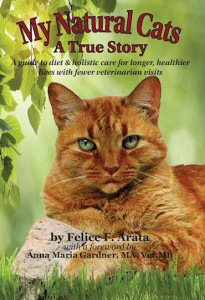 The numbers of felines shedding pathogenic type organisms (Giardia and Cryptosporidia species) were on average slightly higher for the felines that were fed the raw diet. Therefore, it appeared that the raw rabbit diet did not have its beneficial effects on stool quality by reducing pathogenic organisms in the intestine, altering the numbers of bacteria in the small intestine or by diminishing the levels of inflammatory changes in the intestinal wall. Although it appeared that the raw rabbit diet was significantly beneficial for the stool quality and appearance of health in the felines, the sudden and rapidly fatal illness of one of the felines that were fed the raw rabbit diet for 10 months was chilling and unexpected. The affected feline was diagnosed with dilated cardiomyopathy due to a severe Taurine deficiency. Moreover, 70% of the remaining raw rabbit diet fed felines, which appeared outwardly healthy, also had heart muscle changes compatible with Taurine deficiency and could have developed heart failure if continued on our raw rabbit diet. For the remaining three months of the study, the raw rabbit diet was supplemented with Taurine and Taurine levels returned to normal.